The Inglis Bloodstock Team has been out on the road inspecting weanlings and discussing the company’s six select yearling sales options offered in Sydney, Melbourne and Scone next year. Entry into the sales series are due this Friday 31 July. “On the back of strong sales ring results this year the enthusiastic response from vendors I have visited in New Zealand and Australia over the last few months is very promising, as are the stock already committed to our 2016 yearling sales,” says Jonathan D’Arcy, Inglis’ National Bloodstock Director. 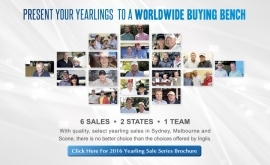 “Selecting the right sale for your yearling has never been more important and I think this is where Inglis can be of enormous assistance to breeders with our team having already visited a large number of farms in recent months and able to advise on the relative merits of each individuals young stock. “We are still on the road during August and will begin official inspections in the first week of September. Anyone wanting sales advice is welcome to contact any member of our bloodstock team in Sydney or Melbourne and we are only too happy to come and have a look at the horses and sit down with you to discuss where they are best offered,” said D’Arcy. The Inglis Bloodstock Team have been impressed by the young stock by first season sire’s Pierro, All Too Hard, Delago Deluxe, Ocean Park, Americain and many others, plus the second crop of well received stallions Sepoy, So You Think, Foxwedge and Smart Missile. Given the first season success of horses like Zoffany, Canford Cliffs, Dream Ahead and Uncle Mo in the Northern Hemisphere Inglis’ buyers might be looking a bit more closely at their progeny in 2016. “Snitzel, Sebring, Fastnet Rock and I Am Invincible have quality throughout their weanlings, while 2016 will see smaller crops from Redoute’s Choice, More Than Ready and Lonhro, plus the last crop from Street Cry and Commands. We are keen to maximise our numbers by these stallions in the Inglis Yearling Sales Series next year,” adds D’Arcy. Inglis’ Victorian Bloodstock Team, including new addition James Price, have been clocking up the kilometres since the Great Southern Sale in readiness for another busy winter and spring inspection schedule. “Hardened by six straight years of growth at Inglis Premier the increased level of support from Victorian breeders for their state’s leading sale in 2016 is very encouraging,” said Inglis Bloodstock Consultant James Price. There is great diversity of bloodlines and peak distance success in the Australian stallion ranks and Inglis are best equipped to offer its Bloodstock Team’s expertise and range of sales to optimise results for all individual yearlings entered for sale. To discuss the sales placement of your yearlings with a member of Inglis’ experienced and independent bloodstock team call Sydney on +61 2 9399 7999 or Melbourne on +61 3 9333 1422.